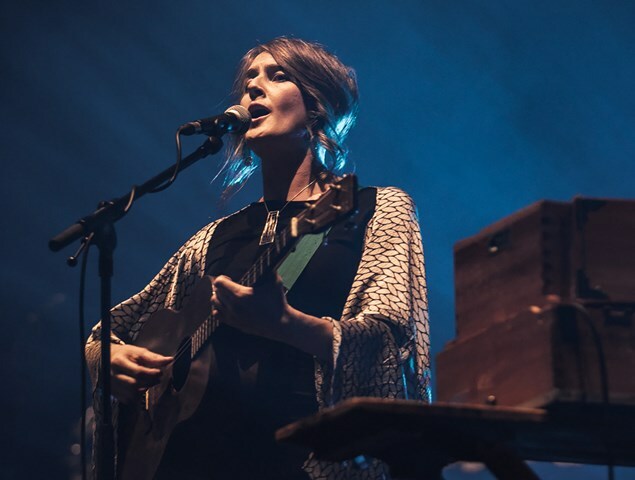 We are huge fans of the award-winning singer Karine Polwart here at Glasgow Music City Tours and still go a bit fluttery at the memory of her Celtic Connections concert where she, her brother Steven and writer James Robertson performed a tribute to Joni Mitchell’s Hejira album. This year she joins Kris Drever and the Scottish Chamber Orchestra for a special collaboration in Celtic Connections’ newest venue, the King’s Theatre. But she will also reprise her wonderful Scottish Songbook concert which she first explored at Celtic Connections a couple of years ago and then fleshed out for a show at the Edinburgh International Festival last August to cover songs by Scottish artists from across the popular music spectrum. My mum was into Gerry Rafferty and Donovan, Hamish Imlach, stuff like that, and I maybe knew that they were Scottish but it was of no concern to me at that point, I just loved the stuff. It didn’t matter until I was in my early teens, and then there was a point where it really did matter. The first person that I remember being chuffed was Scottish was Annie Lennox. I absolutely worshipped Midge Ure and used to draw charcoal pictures of him and had him all over my wall. He was so stylish with that wee ’tache. He was the first Scottish pop star that I fell totally in love with. But Big Country and the Cocteau Twins would be geographically the closest bands to me growing up in Denny and there was a reflected coolness that came off that. There were a couple of cool lads at school who wore plaid shirts and there was a pride in the fact that Big Country were local and talking about something familiar. And it was quite exciting if somebody came back from being at a party with somebody who was Liz Fraser’s pal. That kind of stuff where you feel you are one removed from grace. I went to university in Dundee and I lived right next to the student union. That was the point where loads of the bands coming through were Scottish, Texas and the Kevin McDermott Orchestra, The Big Dish were a big band at that time, loved them. But at that time it wasn’t even a remote possibility that this was something I would do. I went to sessions and sang songs for fun but it was inconceivable that I would be a musician. I was really shy apart from anything else and they operated on a different level, they all seemed extremely cool and good-looking and confident which was not me. I realise there is great big gaping holes in my knowledge. There’s whole periods of my life when pop music disappears because I’ve been in a library looking at folk songs. So there’s a period in the 90s which is a bit of a blackout, because I was just geeking out on something else at that point. It’s impossible to tell the whole narrative because some of the songs are so wedded to the sound of the records, the production or the vocal style of the person that’s singing it, so I guess I’ve had to go looking for songs that have a narrative element or a feeling that can get eked out in a different way. It’s more about singing songs where you’ve really got a heart connection with them for one reason or another, just trying to listen to something with a head for how you might insert yourself into it and not just default to all the massive hitmakers. Karine Polwart’s Scottish Songbook is at Old Fruitmarket, Glasgow on 2 Feb, and Karine Polwart and Kris Drever play with the Scottish Chamber Orchestra at the King’s Theatre on 27 Jan.